Periodontitis, an inflammatory disease of supporting tissues of the teeth, is caused by a specific microorganism or group of specific microorganisms and results in the progressive destruction of periodontal tissues and pocket formation, recession, or both. Using checkerboard DNA–DNA hybridization, Socransky et al. identified five microbial complexes, which are repeatedly found together in subgingival biofilm. Among these, the “red complex” is considered the most pathogenic microbial complex. In addition to the red complex, different combinations of bacterial species have been reported to be the causative agents for periodontitis such as the combination of Porphyromonas gingivalis (Pg) and Aggregatibacter actinomycetemcomitans (Aa) which has been shown to play an important role in periodontal pathology in various studies. Various approaches applied for the treatment of periodontitis include mechanical therapy, periodontal surgery, and use of local and systemic antibiotics. All these treatment approaches aim at controlling the infection which is important for proper wound healing and subsequent regeneration of periodontal tissues, but there is always a risk of bacterial contamination with surgical procedures, and sometimes even after stringent disinfection, bacteria may still be able to survive and infiltrate into deeper tissues. In addition to the regenerative potential, the antibacterial activity of the platelet concentrates has been reported against Staphylococcus aureus, Escherichia More Details coli,Klebsiella pneumoniae, and Streptococcus oralis among the other microorganisms. The leukocytes in PRF are known to exhibit antimicrobial activity. There are a few studies where antibacterial activity of PRP and PRF has been compared against Pg and Aa., However, there is not much evidence for the antibacterial activity of I-PRF against these periodontal pathogens since I-PRF has been recently introduced. I-PRF is being studied for its regenerative potential and release of growth factors, and owing to its ease of preparation and capability to be used with other biomaterials, its other properties including the antibacterial property also need to be explored. Hence, in this study, I-PRF is being compared with the other two platelet concentrates, that is, PRP and PRF, for its antibacterial effect against two periodontal pathogens: Pg and Aa using well diffusion method and comparing the zones of inhibition. The participants for our study were selected from individuals visiting the Department of Periodontology in our college and the samples were analyzed for their antimicrobial activity in the department of Microbiology. The research was started after obtaining the ethical clearance from the institute. Gingival index  (Loe and Silness-1967) was recorded and a total of ten systemically and periodontally healthy individuals with age above 25 years were included in the study. Individuals selected did not have any bleeding on probing or gingival inflammation (gingival index score <1). All the individuals with probing depth ≥3 mm and the presence of clinical attachment loss, habit of smoking or tobacco chewing, any systemic diseases or infections, individuals using anti-inflammatory or antibiotic drugs for the last 6 months, and pregnant and lactating mothers were excluded from the study. Written informed consent was taken from all the individuals. 10 ml of blood was withdrawn from each individual. 3 ml was used for PRP preparation, 3 ml for PRF preparation, and 3 ml for I-PRF preparation. The remaining 1 ml of blood was used for determining the platelet count. For I-PRF preparation, 3 ml of blood was taken into a blood-collecting tube without any additives and centrifuged at 700 rpm for 3 min  [Figure 1]a. For PRF preparation, 3 ml of blood was taken into a glass blood-collecting tube without any additives and centrifuged at 3000 rpm for 10 min  [Figure 1]b. For PRP preparation, 3 ml of blood was collected into a blood-collecting tube containing 3.2% sodium citrate. First centrifugation was done at 1000 rpm for 13 min. The top layer of plasma was drawn out and centrifuged again at 2000 rpm for 10 min. After the centrifugation, the upper half of the superficial plasma was discarded and the lower half was used for testing the antimicrobial activity  [Figure 1]c.
Agar plates inoculated with bacterial strains: Porphyromonas gingivalis (ATCC No. 33277) and Aggregatibacter actinomycetemcomitans (ATCC No. 43718) were labeled and divided into three compartments with the marker on the bottom of the plate for PRP, PRF, and I-PRF. The preparations obtained were divided into two parts to be used for the cultures of Pg and Aa separately [Figure 2]. The plates were then incubated at a temperature of 37°C for 24 h in anaerobic environment. The antimicrobial efficacy was, then, analyzed by measuring the clear zone of inhibition around the samples. After 24 hours of incubation clear zones of inhibition were observed around the platelet concentrates [Figure 3]. The mean widths for the zones of inhibition for PRP, PRF, and I-PRF on the agar plates inoculated with Pg and Aa are listed in [Table 1] along with the standard deviations. The mean width of the zones of inhibition obtained around all the samples were compared using Wilcoxon signed-rank test, and the results are shown in [Table 2]. In case of Pg, I-PRF had the widest zone of inhibition which was significantly wider as compared to PRF (P < 0.05). Furthermore, PRP had significantly wider zone of inhibition against PRF (P < 0.05). Although I-PRF had a wider zone of inhibition as compared to PRP, the difference was not statistically significant. In case of Aa, PRP had a significantly wider zone of inhibition as compared to that of PRF and I-PRF (P < 0.05). PRF and I-PRF did not show any statistically significant difference between the widths of their zones of inhibition. Platelet concentrates are increasingly being used in periodontal surgeries, particularly because of their regenerative potential. Platelets play a vital role in wound healing. They release growth factors such as platelet-derived growth factor, transforming growth factor (TGF-β), vascular endothelial growth factor, epidermal growth factor, and insulin-like growth factor on activation. Platelets provide matrix for connective tissue by secreting fibrin, fibronectin, and vitronectin, which also help in cell migration. In this way, platelets play an important role in proliferation of cells, synthesis of collagen, and formation of osteoid.,, Hence, over the years, various techniques were developed for the platelet concentrates. The platelet concentrates being autologous minimize the chances of infection and development of antibodies, but in PRP preparation, usually, thrombin and calcium are required which can lead to the development of antibodies against the clotting factors V and XI and thrombin. This can adversely affect the coagulation process and also lead to an immune reaction. PRF, on the other hand, is the second-generation platelet concentrate introduced by Choukron (2001), which does not involve any use of bovine thrombin or anticoagulant, considerably reducing the biochemical handling of blood as well as risks associated with the use of any additives. In PRF, fibrinogen slowly and naturally gets polymerized to fibrin using the thrombin that is physiologically available and thereby forms architecture that helps in wound healing and prevents the proteolysis of growth factors. PRF also helps in microvascularization, thus helping in cell migration. The fibrin matrix of PRF contains a large quantity of platelet and leukocyte cytokines and they are progressively released over time (7–11 days) as the fibrin network disintegrates. I-PRF is based on the similar concept as PRF, but is available in an injectable form. This injectable PRF has the advantage that it can be used alone or in combination with other biomaterials easily. It is proposed to contain a higher number of regenerative cells and a higher concentration of growth factors because of the slower and shorter centrifugation spin. Furthermore, it has been observed that I-PRF forms a small clot because of its fibrin components which behaves as a dynamic gel-containing cells and releases additional growth factors even beyond 10 days. PRP, however, dissolves by that time. As far as the antimicrobial efficacy of platelet concentrates is concerned, there are few studies in which PRP and PRF have been tested for their antimicrobial efficacy. Yang et al. 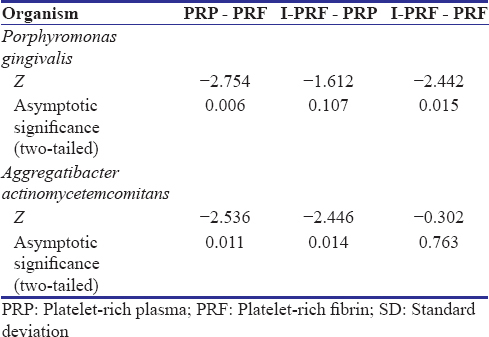 in 2015 compared the antimicrobial activity of four plasma fractions, that is, PRP, platelet-poor plasma, platelet-depleted plasma, and PRF against Pg, Aa, and Fusobacterium nucleatum and found that PRP had the highest antibacterial activity. Badade et al. in 2016 studied the antimicrobial efficacy of PRP and PRF against Pg and Aa and found that Pg and Aa were only inhibited by PRP and not by PRF. However, in our study, we found that antibacterial activity was seen with both PRP and PRF though the zone of inhibition was significantly wider with PRP. Joshi et al. also carried out a study in 2016 in which PRF demonstrated clear zone of inhibition against subgingival plaque sample and calorimetric analysis confirmed the minimum amount of turbidity using PRF. Thus, the results obtained in our study are coinciding with the results in this study, with PEF having at least some antimicrobial activity. I-PRF, being recently introduced, is not much explored for its antibacterial activity except for one study by Karde et al. in 2017 where the antibacterial activity of PRP, PRF, and I-PRF was tested on the supragingival plaque and it was observed that I-PRF showed a maximum zone of inhibition followed by PRP and then PRF. In our study, in case of Pg, similar results were found, with I-PRF having the maximum antibacterial activity followed by PRP, and the least antibacterial activity was shown by PRF. However, the difference was insignificant when comparing I-PRF and PRP. Furthermore, in the case of Aa, PRP showed the maximum antibacterial activity and PRF and I-PRF did not show any significant difference. I-PRF has no artificial additives. So, the higher antimicrobial activity with I-PRF in case of Pg could be purely due to the higher concentration of platelets and other blood cells such as leukocytes in I-PRF as compared to the other platelet concentrates. This can be explained with the “low-speed concept” by Ghanaati et al. for blood centrifugation whereby lower centrifugation speeds were shown to contain higher numbers of cells including leukocytes before the formation of a fibrin clot. Hence, the increased number of platelets and cells can be considered responsible for the higher antimicrobial activity of I-PRF. PRP also showed antibacterial activity, but it has the additives such as sodium citrate and calcium chloride which could have contributed to its antibacterial activity at least to some extent. Sodium citrate is already known to have antibacterial activity against Streptococcus pneumonia and several oral bacteria. Aa, on the other hand, was found to have narrower zones of inhibition for I-PRF as compared to PRP. If we take the antibacterial activity of sodium citrate into consideration, it can be said that Aa was quite resistant to the platelets, leukocytes, and other components of platelet concentrates that were present in greater quantities in the I-PRF since the same samples of platelet concentrates divided into halves were used for both Pg and Aa. In our study, PRF showed lower antibacterial activity as compared to the other platelet concentrates and that may be because of the lower concentration of platelets and leukocytes in PRF as compared to the other platelet concentrates. Furthermore, all the platelets and cytokines that are in higher concentration as compared to the whole blood are embedded in the autologous fibrin matrix and would be completely released once the fibrin meshwork disintegrates., Hence, observation over a longer time can be helpful to analyze the antibacterial activity in case of PRF. Even I-PRF gets transformed into gel state and stays for a longer time as PRP dissolves away faster. Therefore, even I-PRF can be observed over a longer period to observe if it has higher antibacterial extended over a longer period. As no significant difference was observed between PRP and I-PRF in case of Pg and PRF and I-PRF in case of Aa, the study can be conducted on a larger sample size to confirm if the difference is significant. The exact component of the platelet concentrates responsible for the antimicrobial activity has not yet been established, since in addition to the platelets, there is also the presence of white blood cells and the plasma. Various mechanisms have been hypothesized for the antibacterial effect of platelet concentrates such as generation of oxygen metabolites, including superoxide, hydrogen peroxide, and hydroxyl-free radicals; binding, aggregation, and internalization of microorganisms; and release of an array of antimicrobial peptides. The direct interaction of platelets with microorganisms, participation in antibody-dependent cell cytotoxicity and engulfment by entrapped white blood cells within PRF, could also result in direct bacterial killing as proposed by Yeaman. Furthermore, the release of myeloperoxidase, antigen-specific immune response, and activation of the antioxidant responsive elements are the other mechanisms that have been suggested. The leukocytes that are present in much greater concentrations along with the platelets in these platelet concentrates as compared to the whole blood are already known for their antibacterial activity. Neutrophils exhibit this action by secreting the myeloperoxidase present in the granules. Furthermore, monocytes produce the cytokines and chemotactic factors that participate in inflammation. The platelet microbicidal proteins (PMPs) include various materials such as platelet factor 4, connective tissue activating peptide 3, thymosin beta-4, platelet basic protein, and fibrinopeptide B which have an antibacterial activity. These PMPs could exhibit the antimicrobial activity by coming in contact with the bacterial membrane, altering the permeability of the membrane, entering the cell, and blocking the synthesis of important molecules. Although the conventional periodontal therapy helps in considerable reduction in the count of periodontal pathogens at the infected loci, elevated levels of periodontal pathogens have been reported few weeks after the therapy. Bacterial infection can impair wound healing and periodontal regeneration and so antibiotics are usually prescribed after the surgery. However, due to increased incidences of antibiotic resistance, alternative methods are being sought after and platelet concentrates seem to be a very useful adjunct. Although their antibacterial activity is limited as compared to antibiotics, studies need to be done to evaluate if antibiotic dosage can be reduced in cases the platelet concentrates are used. I-PRF and PRF which are completely autologous and do not contain any additives can be preferred and I-PRF more so because of greater antimicrobial activity. To our knowledge, this is the first study in which three platelet concentrates PRP, PRF, and I-PRF have been compared for their antibacterial activity against Pg and Aa. Within the limitations of the study, all the three platelet concentrates showed some amount of antimicrobial activity and I-PRF and PRP have proved to be powerful weapons in the battle against periodontal pathogens. This might be a valuable adjunctive property to the enhancement of tissue regeneration. However, I-PRF and PRF have an advantage of being completely autologous without any additives and anticoagulants and also application of I-PRF is minimally invasive. Both the PRF and I-PRF need to be analyzed over a longer period for their antimicrobial activity. Furthermore, a larger sample size can be analyzed to establish the correlation between the platelet concentration and the antibacterial activity if the exact component of the platelet concentrates responsible for the antibacterial activity is to be established. Since there is limited literature available related to this novel platelet concentrate, that is, I-PRF, further research is required to explore its properties of regeneration and healing. We owe our deep gratitude to Dr. Kishore Bhat, Professor and Head, Department of Microbiology, Director, Department of Molecular Biology and Immunology, Maratha Mandal's NGH Institute of Dental Sciences and Research Center, Belagavi, for his constant support throughout this study. Carranza FA, Newman MG, Takei HH, Klokkevold PR. Carranza's Clinical Periodontology.10th Edition, Saunders Co., Lindo. (2006). Torrungruang K, Jitpakdeebordin S, Charatkulangkun O, Gleebbua Y. Porphyromonas gingivalis, Aggregatibacter actinomycetemcomitans, and Treponema denticola/Prevotella intermedia co-infection are associated with severe periodontitis in a Thai population. PLoS One 2015;10:e0136646. El-Sharkawy H, Kantarci A, Deady J, Hasturk H, Liu H, Alshahat M, et al. Platelet-rich plasma: Growth factors and pro- and anti-inflammatory properties. J Periodontol 2007;78:661-9. Bertrand-Duchesne MP, Grenier D, Gagnon G. Epidermal growth factor released from platelet-rich plasma promotes endothelial cell proliferation in vitro. J Periodontal Res 2010;45:87-93. Anitua E, Troya M, Orive G. Plasma rich in growth factors promote gingival tissue regeneration by stimulating fibroblast proliferation and migration and by blocking transforming growth factor-β1-induced myodifferentiation. J Periodontol 2012;83:1028-37. Anitua E, Tejero R, Zalduendo MM, Orive G. Plasma rich in growth factors promotes bone tissue regeneration by stimulating proliferation, migration, and autocrine secretion in primary human osteoblasts. J Periodontol 2013;84:1180-90. Anitua E, Troya M, Orive G. An autologous platelet-rich plasma stimulates periodontal ligament regeneration. J Periodontol 2013;84:1556-66. Choukroun J, Adda F, Schoeffer C, Vervelle A. PRF: An opportunity in perio-implantology. Implantodontie 2000;42:55-62. Choukroun J. Advanced PRF & I-PRF: Platelet concentrates or blood concentrates? J Periodontal Med Clin Pract 2014;1:3. Miron RJ, Fujioka-Kobayashi M, Hernandez M, Kandalam U, Zhang Y, Ghanaati S, et al. Injectable platelet rich fibrin (i-PRF): Opportunities in regenerative dentistry? Clin Oral Investig 2017;21:2619-27. Moojen DJ, Everts PA, Schure RM, Overdevest EP, van Zundert A, Knape JT, et al. Antimicrobial activity of platelet-leukocyte gel against Staphylococcus aureus. J Orthop Res 2008;26:404-10. Bielecki TM, Gazdzik TS, Arendt J, Szczepanski T, Król W, Wielkoszynski T, et al. Antibacterial effect of autologous platelet gel enriched with growth factors and other active substances: An in vitro study. J Bone Joint Surg Br 2007;89:417-20. Anitua E, Alonso R, Girbau C, Aguirre JJ, Muruzabal F, Orive G, et al. Antibacterial effect of plasma rich in growth factors (PRGF®-endoret®) against Staphylococcus aureus and Staphylococcus epidermidis strains. Clin Exp Dermatol 2012;37:652-7. 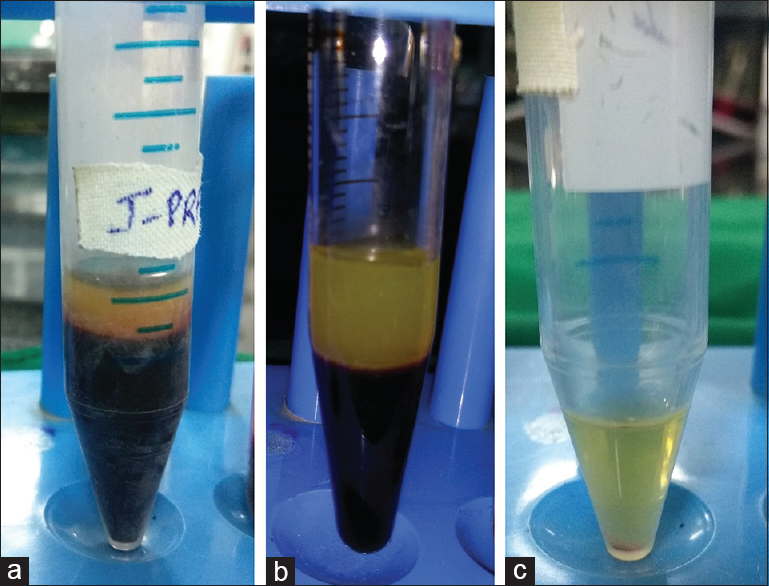 Drago L, Bortolin M, Vassena C, Taschieri S, Del Fabbro M. Antimicrobial activity of pure platelet-rich plasma against microorganisms isolated from oral cavity. BMC Microbiol 2013;13:47. Yang LC, Hu SW, Yan M, Yang JJ, Tsou SH, Lin YY, et al. Antimicrobial activity of platelet-rich plasma and other plasma preparations against periodontal pathogens. J Periodontol 2015;86:310-8. Badade PS, Mahale SA, Panjwani AA, Vaidya PD, Warang AD. Antimicrobial effect of platelet-rich plasma and platelet-rich fibrin. Indian J Dent Res 2016;27:300-4. Preeja C, Arun S. Platelet-rich fibrin: Its role in periodontal regeneration. Saudi J Dent Res 2014;5:117-22. Joshi CP, Patil AG, Karde PA, Khedkar SU, Mahale SA, Dani NH, et al. Autologous platelet rich fibrin as a potential antiperiopathogenic agent: An in-vitro study. Int J Periodontol Implantol 2016;1:50-4. Karde PA, Sethi KS, Mahale SA, Khedkar SU, Patil AG, Joshi CP, et al. Comparative evaluation of platelet count and antimicrobial efficacy of injectable platelet-rich fibrin with other platelet concentrates: An in vitro study. J Indian Soc Periodontol 2017;21:97-101. Nagaoka S, Murata S, Kimura K, Mori T, Hojo K. Antimicrobial activity of sodium citrate against Streptococcus pneumoniae and several oral bacteria. Lett Appl Microbiol 2010;51:546-51. Saini R, Saini S, Sharma S. Therapeutics of stem cells in periodontal regeneration. J Nat Sci Biol Med 2011;2:38-42. Yeaman MR. The role of platelets in antimicrobial host defense. Clin Infect Dis 1997;25:951-68. Tang YQ, Yeaman MR, Selsted ME. Antimicrobial peptides from human platelets. Infect Immun 2002;70:6524-33.